With all the excitement at our place recently about Blue-banded Bees I am seeing them everywhere…or so I thought. The insect pictured left (click HERE to see a previous blog about it) is a Sand Wasp (Bembix sp.). 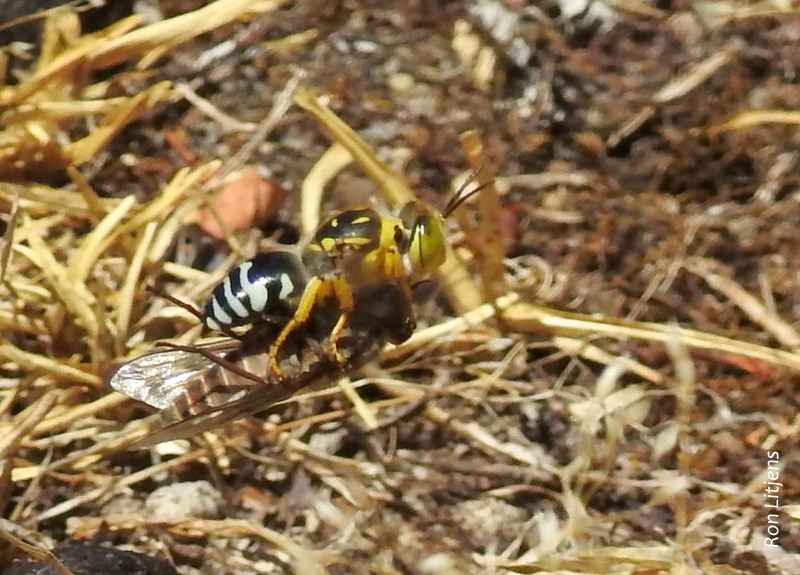 As it hurtles past doing its wasp-like thing it superficially looks (and sounds) like a Blue-banded Bee. Both are building nests at the moment – the BB Bee in dried mud (and lime mortar!) and the Sand Wasp, as the name suggests, in sand. Sand Wasps can be found hovering over bare sandy patches looking for an appropriate place to dig a tunnel in which to build a nest. Using its antennae it assesses a site to make sure the sand is easy enough to dig in but stable enough to support a tunnel without collapsing. Once a site is chosen it braces itself on the two back pairs of legs and rapidly digs a hole using its front pair of leg as scoops (see picture above). Once the tunnel is built the wasp flies off to catch and paralyse an insect, which it does in flight. For Sand Wasps the prey of choice are flies. 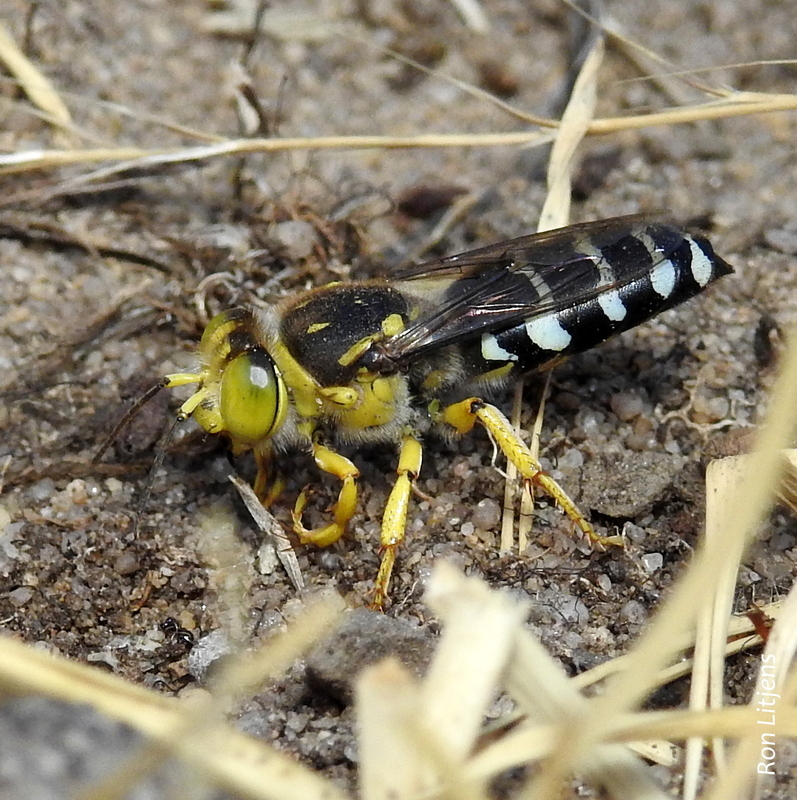 The picture above shows a Sand Wasp carrying an immobilized March Fly back to the nest. The fly is placed in the nest, an egg is laid on it and the tunnel is sealed. 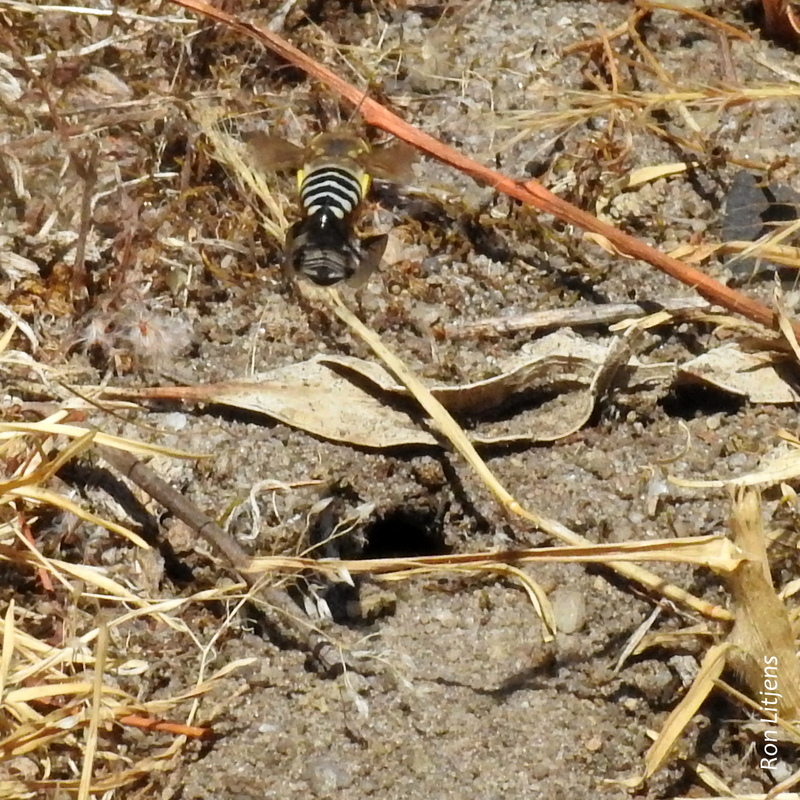 The picture right shows a Sand Wasp approaching the tunnel entrance carrying its prey. This process was fascinating to watch but ended abruptly when Mac the dog, wondering why I was laying on the lawn for so long, came over and stood on the tunnel entrance. I was obviously focused on the wrong fauna.